If you have bad credit, you may have plenty of company but that doesn't mean anything when you want to lease a luxury apartment. The good news is that you don't have to be permanently defined by a spotty credit history. Here's a look at how your credit history impacts your lease application, along with steps you can take to improve your standing. 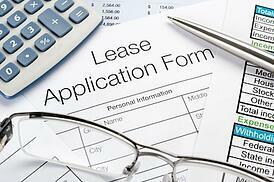 How Does Bad Credit Affect Your Lease Application? Rent is an ongoing obligation that's due each month on a timely basis. A poor credit history may indicate difficulty in handling finances. You might think that paying cash for everything shows responsibility, but a blank credit history is equivalent to a poor one. There is no track record to indicate your ability to make payments. As a rule, good rental history is not included in credit reports. Even if you have always paid rent on time, a prospective landlord would never know without going through the tedious process of contacting your previous landlords. However, if uncollected rent has ever been sent to a collection agency, it will show up on your credit report. Request a copy of your credit report before you start your apartment search. Forewarned is forearmed, so you can be prepared to address any rough spots. You may even find erroneous information that can be removed or amended. Set up an automatic payment using your bank’s online banking feature. Not having to schedule payment every month eliminates the possibility of forgetting. Ask a responsible friend or family member to be a guarantor on the lease. Whomever signs is responsible if you default, so honor your obligation and don't take advantage of the guarantor's generosity. If you can swing it, paying a larger security deposit may be an option. Please keep in mind that under the Fair Housing Law leasing agents aren’t allowed to provide specific advice regarding your credit history or credit score, which is why we’ve listed some resources for you here. Our Springs leasing teams have experience working with a wide variety of applicants. Come by for a tour of our luxury apartment homes, then talk to our team members and learn how you can become one of our valued residents.